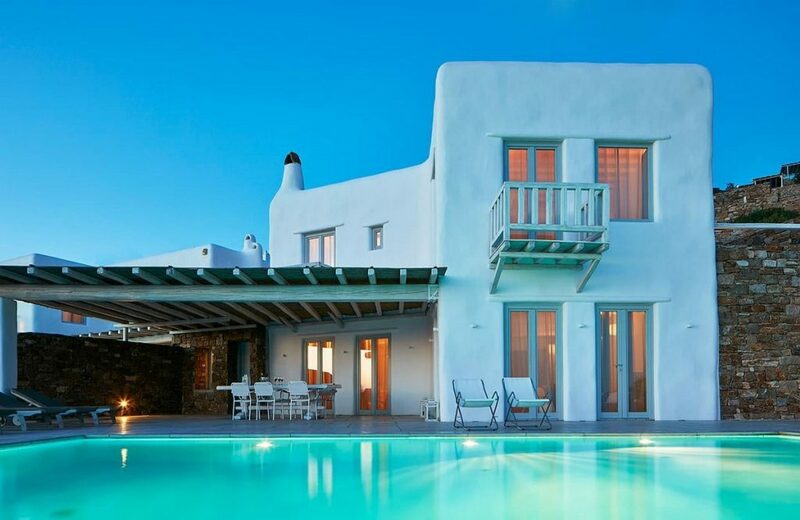 Welcome to Vivianne, the private luxury villa in Houlakia, Mykonos. Although it is part of a three villas complex, it is totally independent! Enjoy stunning views, while swimming in your private infinity pool. Vivianne is the perfect getaway for a group of 8, who need to relax in privacy far from indiscreet eyes. The 3-level villa offers huge lounge areas for relaxation both inside and outside. The exterior design has a bonus of stretching either in the pool or the pergola - depending on whether you’ll get a suntan - but the modern interior is equally nice and relaxing. If you‘d like to explore the island, you can start from Houlakia beach which is less than 1 km away. The town is a longer drive, but those who are in a party mood will make it. Only 5 km separate you from the exciting nightlife! Let’s not forget our gourmet guys! Our traditional and fully equipped kitchen challenges you to make good use of it. If that scenario fails, our concierge will be very happy to arrange a Greek gastronomy night prepared by our best chef. Pick your company and leave the rest on our hands!